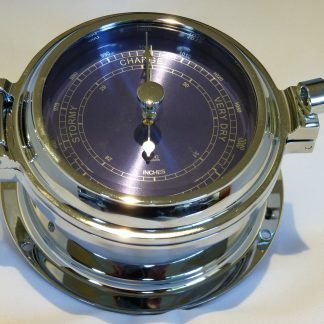 Chrome barometer low profile for recessed fitting into bulkhead. Heavy cast brass instrument case, quality chroming fitted with rubber sealing ring making it suitable for marine applications. The recessed fitting (10mm required) allows the instrument to sit low in the bulkhead so that it does not protrude more than 30mm. The hinged door design allows easy access to the instrument for any adjustments, without removal of the instrument from the bulkhead. Three chrome screws are supplied for fitting. 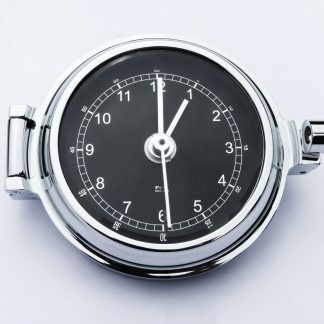 Matching clock available. 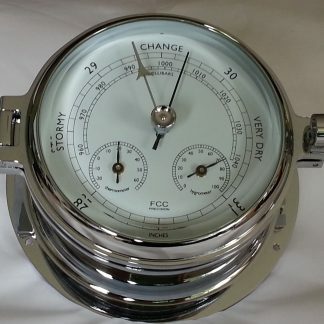 Stunning barometer for boat or home. Barometer and Clock can be mounted on solid ash plinth if required. 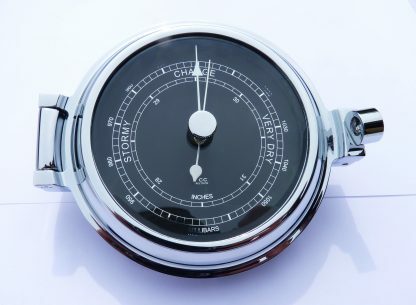 Historically sailors would read and log the Barometer pressure reading on an hourly basis.